The Wizard's Guild is an enchanted guild that is useful for wizards everywhere. It is for members only. 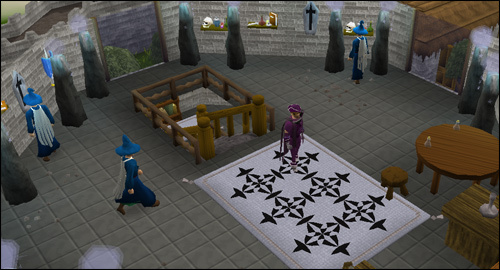 The guild serves as a pleasant place to purchase runes, magic robes, and even to train magic through magical combat. The guild is three floors high, also including a basement. Each floor has something unique that will benefit you in some special way. 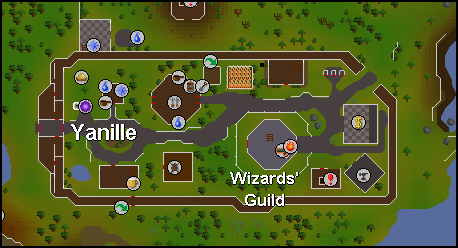 The Wizards' Guild is located around the center of the town of Yanille. Yanille is located south of East Ardougne and east of Castle Wars. The entrance to the guild is a simple set of doubled doors. These doors can be found on the east side of the guild's hexagonal shape. There is also a bell near the entrance. If you cannot enter the guild and need some assistance, ring the bell and Zavistic Rarve will appear. He is the guild's Grand Secretary and can answer questions concerning the Wizards' Guild. Zavistic also plays a part in the quests, Zogre Flesh Eaters and The Hand in the Sand. 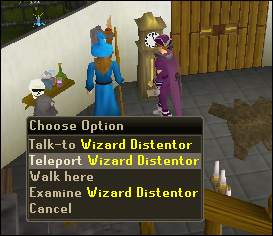 If you try to enter the guild without meeting the level 66 Magic requirement, Wizard Distentor will prevent you from entering. The main points of interest on the ground floor are the people that reside in it. Probably the most popular wizard on the floor is Wizard Distentor. He can teleport players to the Rune Essence mines. 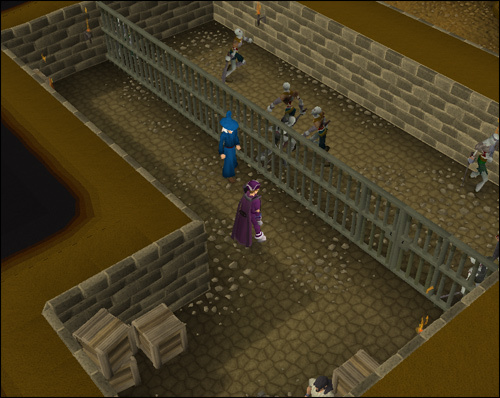 Because the Yanille bank is close to the Wizards' Guild, this is a popular place for players to mine Rune Essence and bank in a short amount of time. 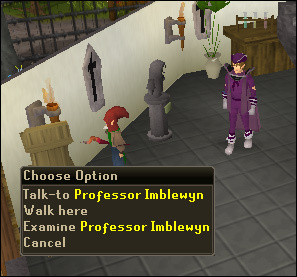 Another interesting person that is on the ground floor is Professor Imblewyn. He is a gnome that is part of the Activity, Gnome Restaurant. If you speak with him, he will tell you about gnomes and their interest in Magic. There are three more persons that reside on the ground floor. Two of them are attackable level 9 Wizards. They do not talk and can only be killed. The other person is someone you've already met: Zavistic Rarve. Whether you speak with him outside or inside of the guild, he still talks about the same things. The middle floor is where all the shopping occurs. There are two stores here: a rune store and a magic robe store. Both stores have the same name, but their stocks are completely different. Also, there are two more level 9 Wizards wandering around. As with the ground floor, you can kill them or leave them alone. 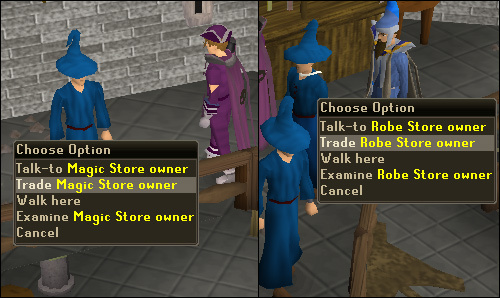 The Robe Store Owner will sell you blue mystic robes that enhance your magic equipment stats. If you would like to buy the whole set, which includes Top, Bottom, Hat, Boots, and Gloves, bring 235,000 coins. 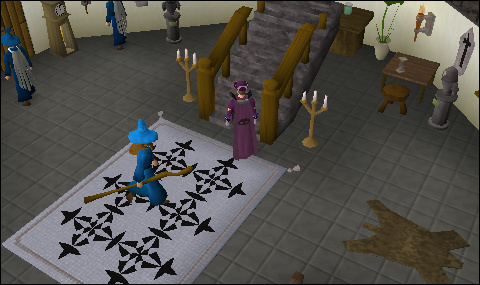 Players who have achieved 99 Magic can also come to the Robe Store Owner to buy the Magic Cape of Achievement from him for 99,000 coins. The Magic Store Owner will sell you runes that are necessary for casting all your spells. He sells every type of rune except Cosmics, Astrals, and Combination Runes, along with the four elemental magic staffs. The Magic Store Owner dresses like the attackable level 9 Wizards, so it might be a little tricky to point him out. However, he does not wear a blue cape nor have buttons on his robe top, so that should help you find him in the wizard crowd. The top floor of the Wizards' Guild is probably the most magical. There is a lot of magical energy flowing through the top. The main attraction on the top floor is the portal system. There are three portals that will teleport you somewhere that is magic related. 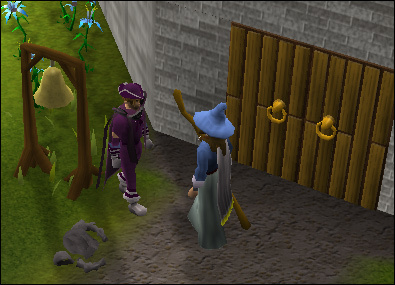 The East portal will teleport you to the Wizards' Tower, south of Draynor Village. 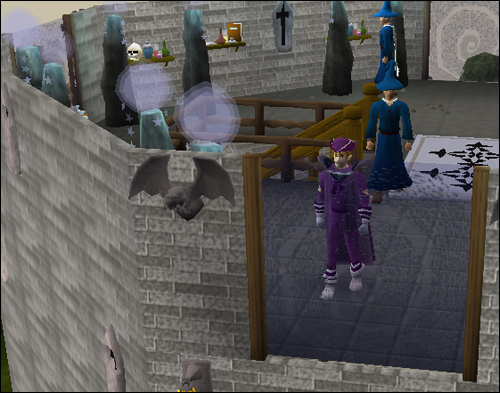 The South portal will teleport you to the Dark Wizards' Tower, west of Falador. Finally, the West portal will take you to Thormac the Sorcerer's House, south of Seers' Village. Other than the portals, there isn't anything else on the top floor that is really interesting. There are three level 9 Wizards that are attackable and two vials that respawn on a table near the west portal. In the southeast corner of the ground floor, there is a ladder. Climb down the ladder to appear in the basement. The basement serves as a training ground. Eight zombies are trapped within a cage and players are to mage them for experience. They are level 24 and respawn very quickly. Wizard Frumscone is in charge of the Zombies. He will make sure you only mage them. If you try to open the gate into the cage, Wizard Frumscone will stop you. 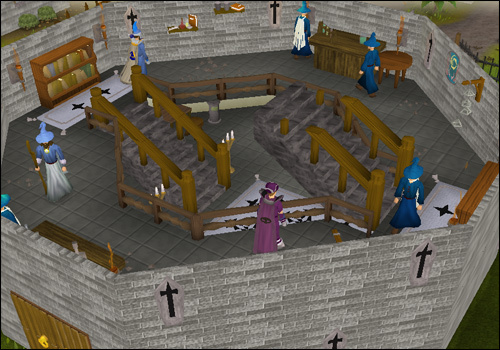 In the back of the Wizards' Guild, there is an open grave. This grave belongs to Clarence, the murdered wizard from the quest, The Hand in the Sand. At the end of that quest, you returned Clarence's head to Zavistic Rarve. The head is currently in the coffin, but the rest of the body is missing. You can find the remaining body parts after completing the quest, Back to my Roots. Kill the creatures in the Karamja maze for body parts and return all of them to Zavistic. The Wizards' Guild staff will have a ceremony and lay Clarence to rest. 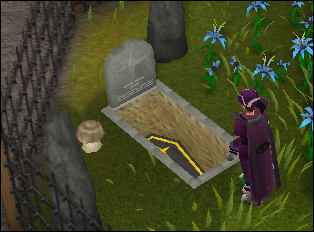 More information can be found in the miniquest guide, Clarence's Funeral.